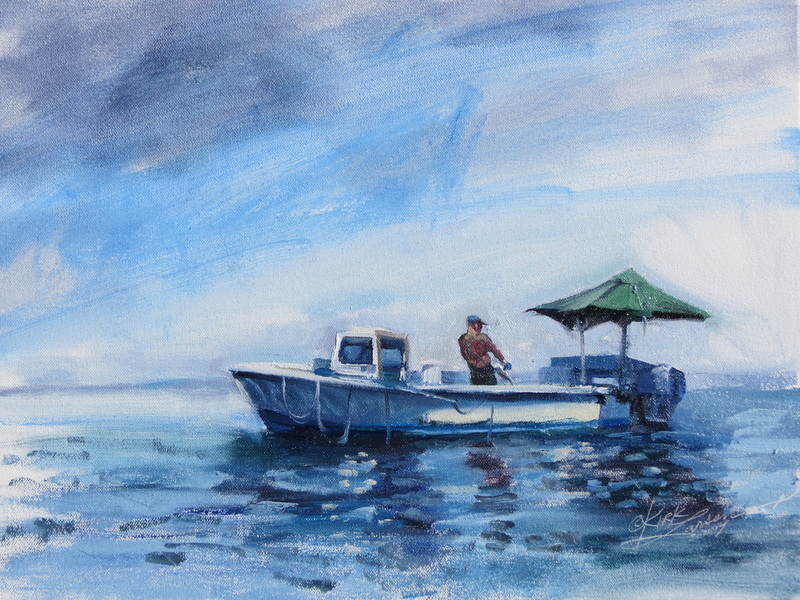 On Saturday, December 19, from 3 to 6 pm, join artist Kirk Larsen for an upbeat holiday season event in celebration of his exhibition Light Over Water: Oyster Bay Harbor Scenes, which closes at the Oyster Bay Historical Society on December 23. The program features an auction of selected work from the exhibition. Last minute shoppers and collectors welcome. The program takes place at the Historical Society’s Angela Koenig Center on 20 Summit Street in Oyster Bay. Entry is free and open to all, but reservations are required. Light refreshments will be served. 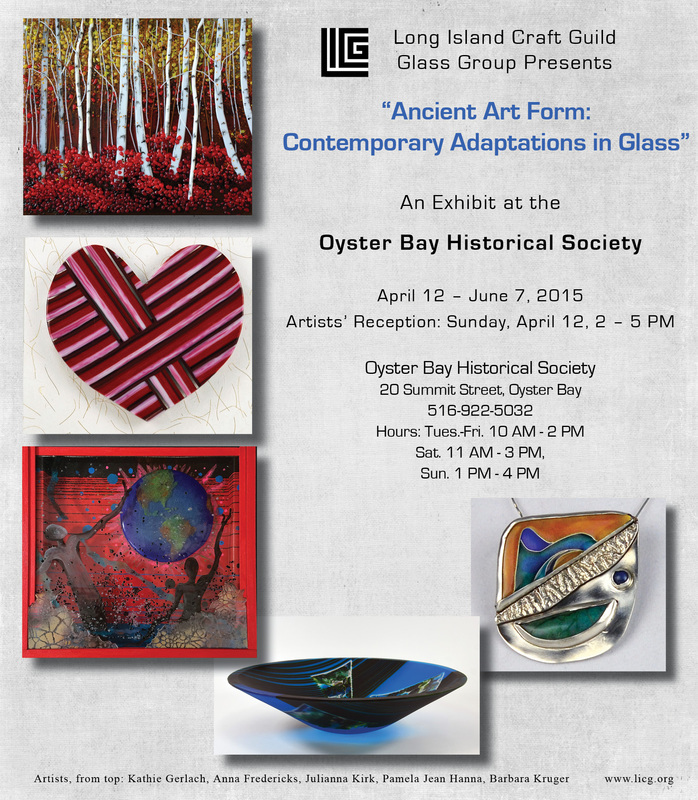 Contact the Oyster Bay Historical Society at 516-922-5032 or obhsdirector@optonline.net. The exhibition remains on view until December 23. Join fiber artists Jacque Blocklyn for her fall knitting-without-needles class. Put down your knitting needles and roll up your sleeves. No knitting experience is necessary, and all supplies will be provided. 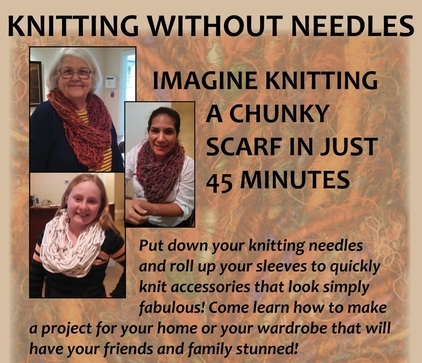 Take home your own arm-knitted treasure.You must register in advance by calling the Society at 516-922.5032. Knitting Without Needles takes place at the Oyster Bay Historical Society's Angela Koenig Center, 20 Summit Street, in Oyster Bay. 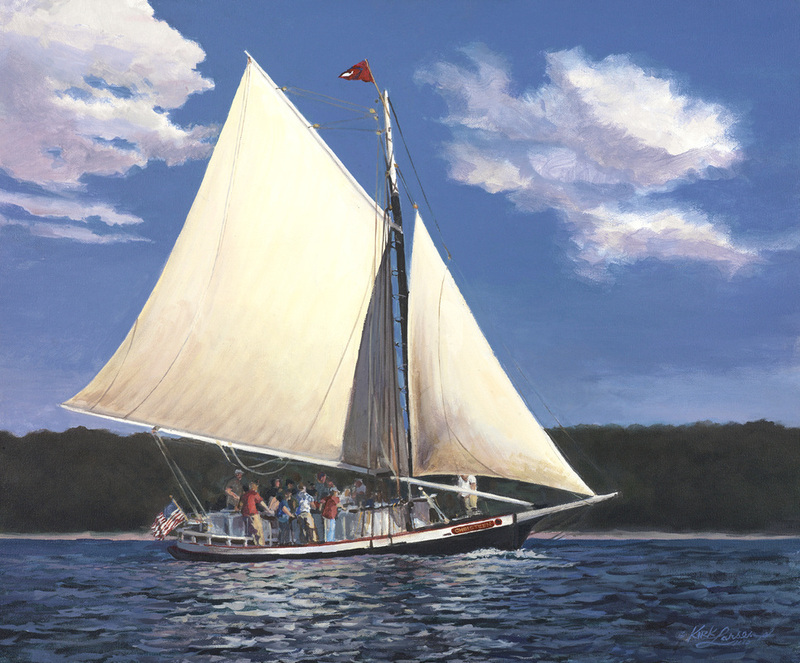 Kirk Larsen shares the powerful inspiration behind his current exhibition Light Over Water: Oyster Bay Harbor Scenes, now on view at the Oyster Bay Historical Society. Mr Larsen examines the creative process at work in many of the fifty-six paintings and drawings on exhibit, as well as recounting the emotional and financial rewards of investing in fine art. Learn some of the basics of how and why to buy art, and discover how ownership of fine art can enrich, enliven, calm, and even heal. A great opportunity for beginners and seasoned collectors alike, this will be an uplifting event for all. 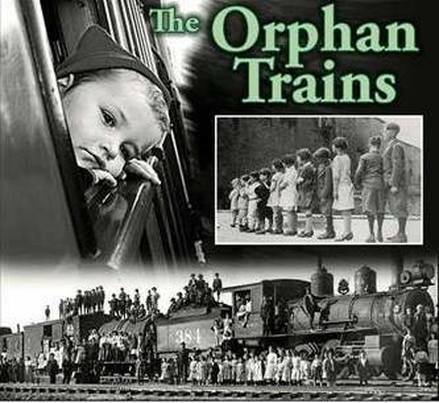 On Tuesday, November 10, join Tom Riley, author of Orphan Train Riders: A Brief History of the Orphan Train Era, for a 45-minutes film screening on the largest mass migration of children in American history. Mr. Riley will also discuss the Great Hunger in Ireland (1845-1952) that ultimately led to the Orphan Trains across half a continent. The program begins at 7 pm in the Oyster Bay Historical Society’s Angela Koenig Center at 20 Summit Street in Oyster Bay. Admission is free and open to the public. Light refreshments will be served. For more information, contact the Historical Society at 516-922-5032 or obhsdirector@optonline.net. The Orphan Train Era is sponsored by the Oyster Bay Railroad Museum in partnership with the Oyster Bay Historical Society. 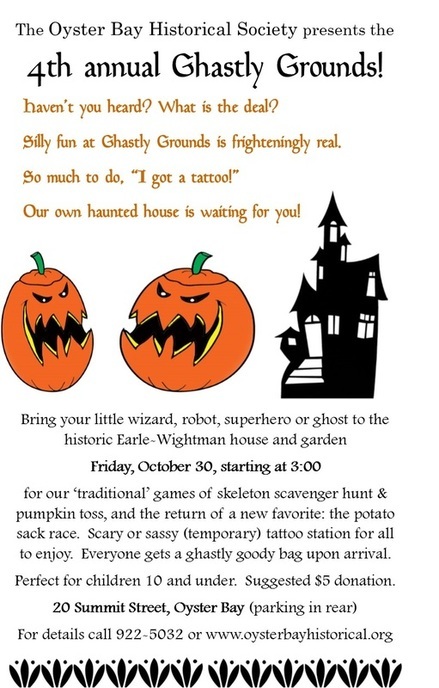 The Oyster Bay Historical Society presents the fourth annual Ghastly Grounds on Friday, October 30th from 3:00 to 5:30 P.M. Bring your little wizard, robot, superhero or ghost to the historic Earle-Wightman house and garden for our ‘traditional’ games of skeleton scavenger hunt and pumpkin toss, and the return of new favorite: the potato sack race. Scary or sassy (temporary) tattoo station for all to enjoy. Everyone gets a ghastly goody bag upon arrival. Perfect for all children ages 10 and under. Suggested $5 donation. 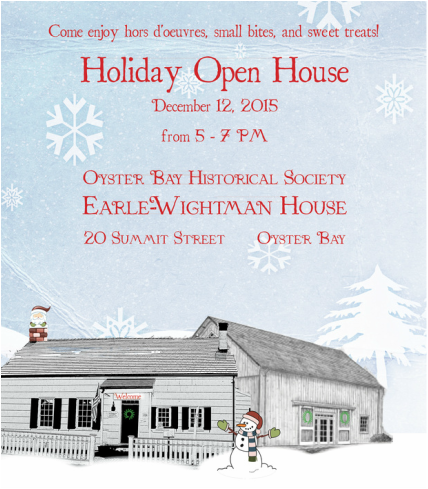 The fun begins at the Earle-Wightman House, 20 Summit Street in Oyster Bay. For details contact the Society at 516-922-5032 or obhslibrary@optonline.net. Oyster Pirates Dredging at Night. 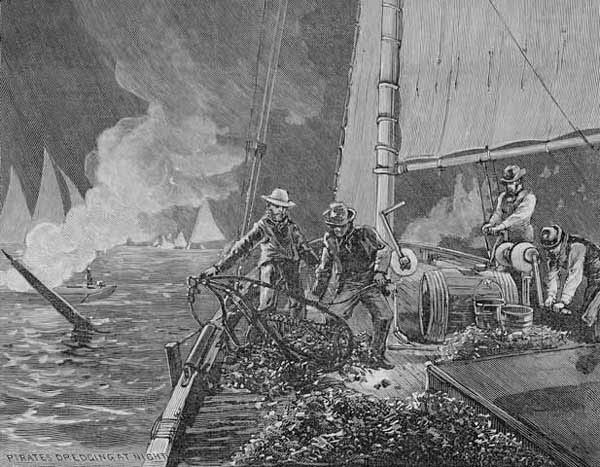 Harper's Weekly, March 1, 1884 (Courtesy of the Mariners' Museum, Norfolk VA). The 19th century was the century of the oyster. With their accessibility and versatility, oysters were the most common form of protein consumed in New York. This popularity fueled the greed of oyster company owners and oystermen all along the eastern seaboard. Uncovering sensational articles taken straight from the New York Times, presenter Nicole Menchise will regale the audience with stories of the unprincipled actions taken by the powerful, the desperate and the every-man in between. The lecture will be held Wednesday, October 28th, at the Koenig Research Center (the barn) located behind the historic Earle-Wightman house on 20 Summit Street in Oyster Bay, NY. Doors open at 6:30 pm, with the lecture beginning at 7:00. Free to the public, with donations welcome. Light refreshments will be served. 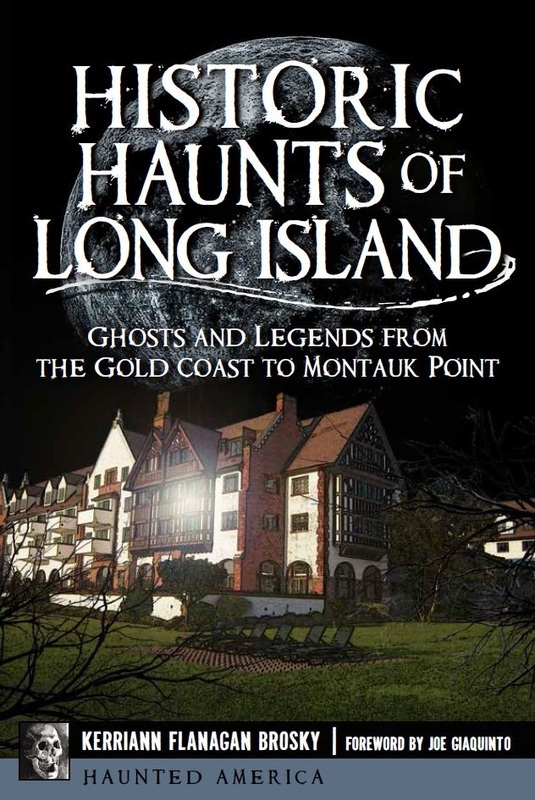 After the success of the Ghosts of Long Island books, Long Island’s haunted past once again comes alive, in award-winning author and historian Kerriann Flanagan Brosky’s latest book Historic Haunts of Long Island; Ghosts and Legends from the Gold Coast to Montauk Point. Ms. Brosky will discuss fascinating new places she has researched and investigated with medium and paranormal investigator Joe Giaquinto. 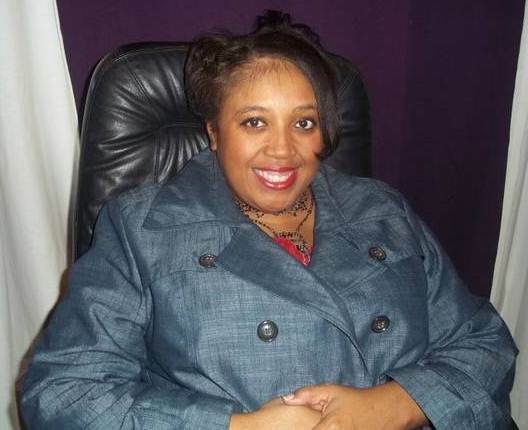 Join her as she uncovers Long Island’s history and ghost tales. 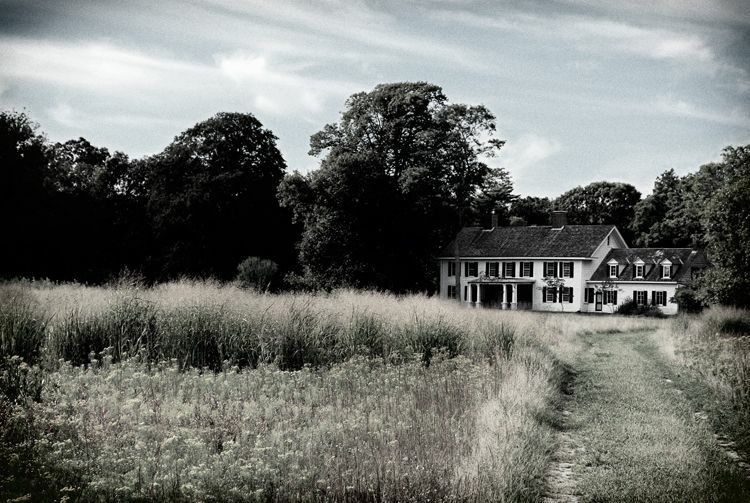 Take a ghostly journey through Long Island’s history, from Native American legends and beyond. Ghosts lurk the Execution Rocks Lighthouse, where Revolutionary War Patriots were brutally tortured and killed by the British during the Battle of Long Island. Popular gathering places have otherworldly tenants, like Bayport’s Grey Horse Tavern and the Cutchogue Village Green, where several old buildings – and their former inhabitants – are preserved. 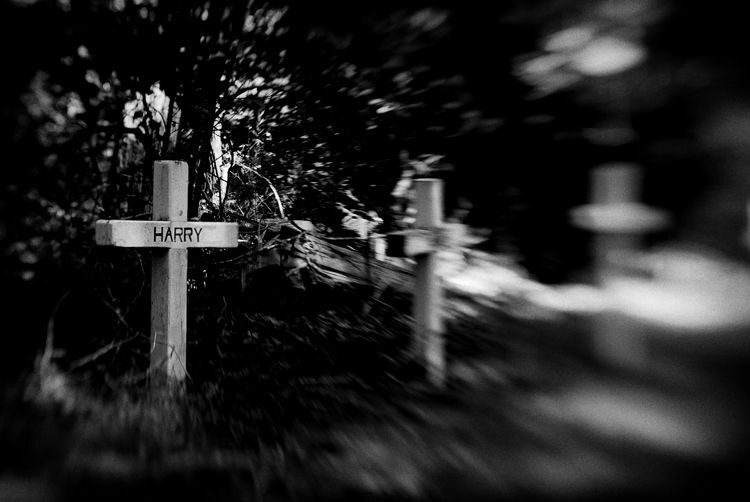 Long Island’s eerie history is unearthed and preserved through its ghost stories and spirits who have made their presence known. 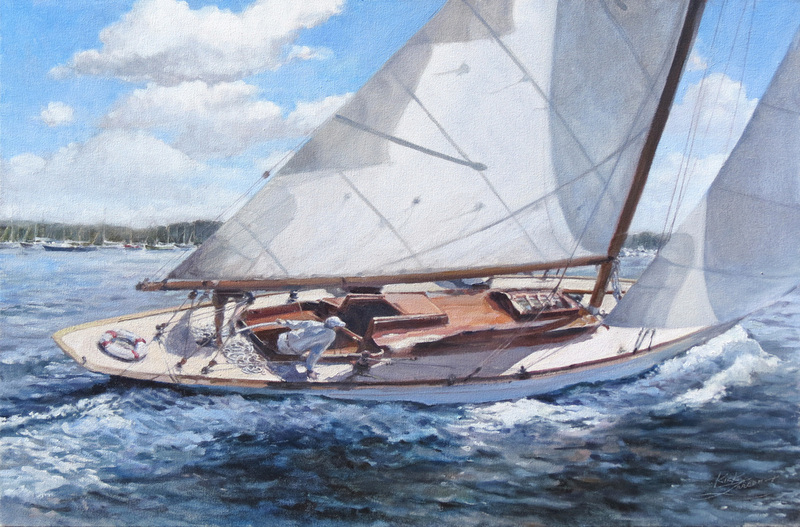 The Oyster Bay Historical Society's fall exhibition features Kirk Larsen's paintings, watercolors, and drawings of the boats, baymen, and yachts of Oyster Bay Harbor. From September 26 through December 23 in the Koenig Center. The sale of exhibited art helps support the Society's Beverly Mohlenhoff Fund, dedicated to the collections and activities of the Angela Koenig Center. 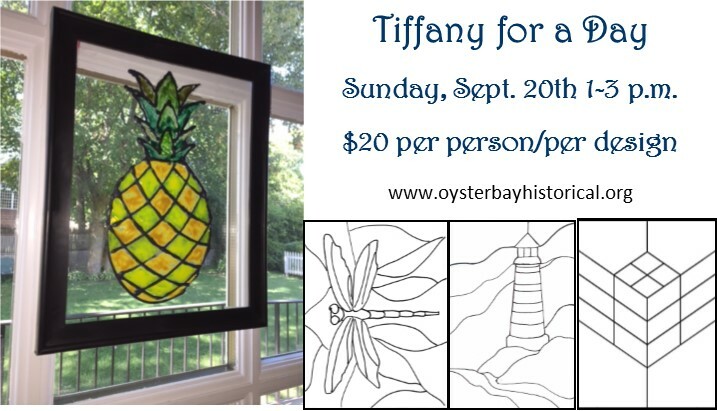 Examples of Tiffany-style glass will be on view for this event only. Pre-registration is required for all participants. Light refreshments and all project materials will be provided. or email obhslibrary@optonline.net for all program details. 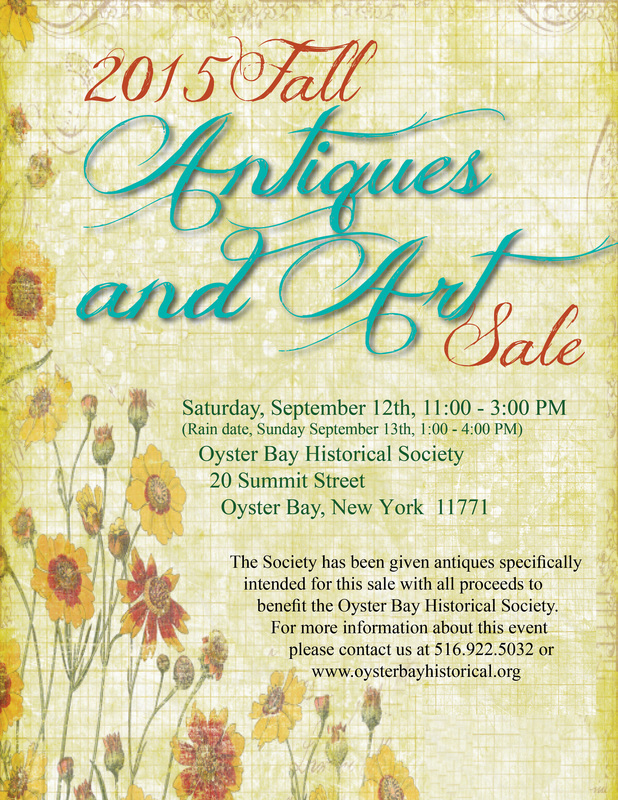 This summer, several friends and neighbors in Oyster Bay have given the Oyster Bay Historical Society a number of antiques that are to be sold for the benefit of the Society. These items, although charming and in superior condition, do not qualify for accession into the archival holdings. Per the request of our contributors, the antiques and art will be for sale on Saturday, September 12th, from 11:00 to 3:00 p.m., with the rain date set for Sunday, September 13th, at 1:00 to 4:00 p.m. Sale will be held in the rear of the Earle-Wightman house and lawn at 20 Summit Street in Oyster Bay. 19th and early 20th century pieces include tables, chairs, marble wash stand, children’s beds and school desks, coal scuttle with Rathborn and Co. heating stove, brass chandeliers, small trunk, heirloom doll cradle and furnishings, miscellaneous décor, vintage toys, Haviland service platters, tureens and casseroles, original artwork, bric-a brac, and much more! 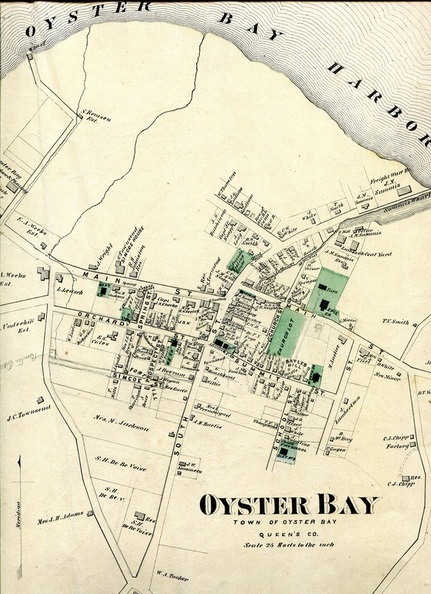 Think you know your Oyster Bay history? Think again! Did Captain Cook stop in Oyster Bay? Did Major John Andre really meet Colonel John Graves Simcoe at the Townsend Homestead? Did the Dodgers really play (and lose) in town? 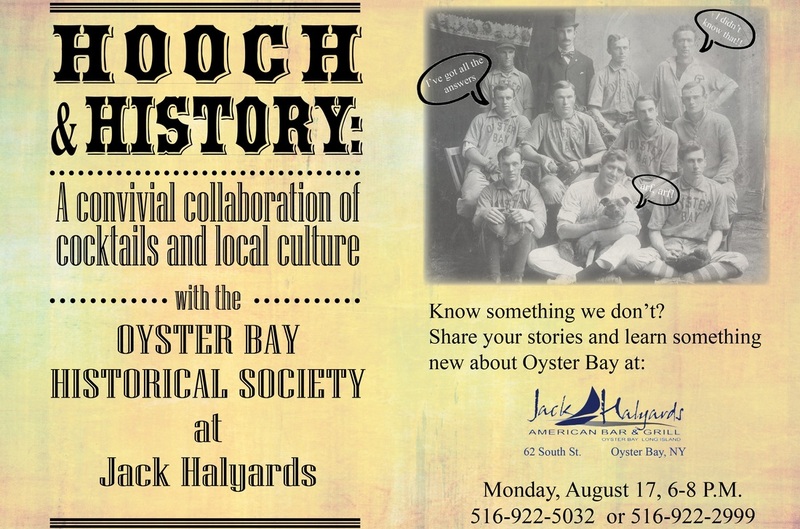 Join Oyster Bay Historical Society’s Philip Blocklyn and Nicole Menchise at Jack Halyards Tavern for drink specials (bar area only) and a lively discussion on the finer points of legend and lore in the hamlet of Oyster Bay. Get the facts and have some fun on Monday, August 17th beginning at 6:00 p.m. at Jack Halyards Tavern, 62 South Street in Oyster Bay. Alcohol consumption encouraged but not required. Contact the Society for details at 922-5032 or obhslibrary@optonline.net. This year's concerts at the Oyster Bay Historical Society take up the theme of America's influence in classical composition. Both programs feature not only American composers but also those from other countries who spent time in America, or were influenced by travels to America. The programs are free and open to the public. A short reception follows each concert, featuring refreshments served by the Oyster Bay Historical Society Cookie Committee. 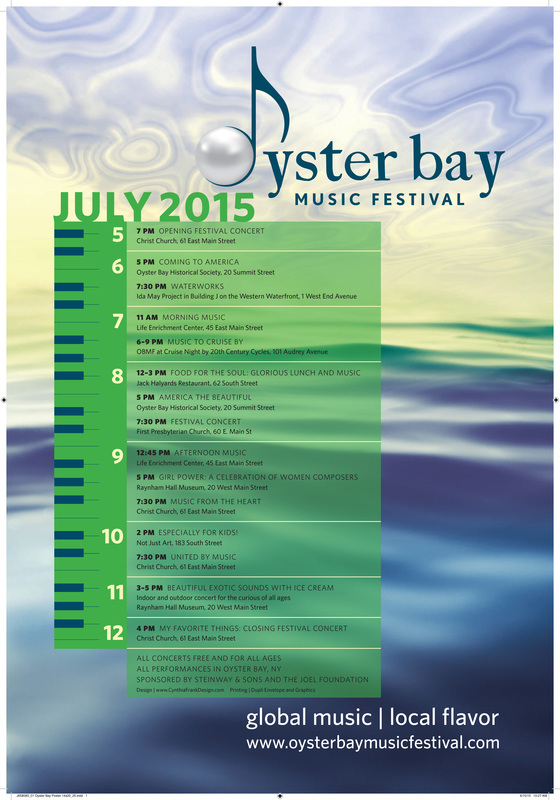 The Oyster Bay Music Festival runs from July 5 through July 12. Talented young musicians from all over Long Island and New York State gather in Oyster Bay to train and perform in engaging, intimate concerts, spreading the excitement of live classical music performance and practicing their craft along the way. 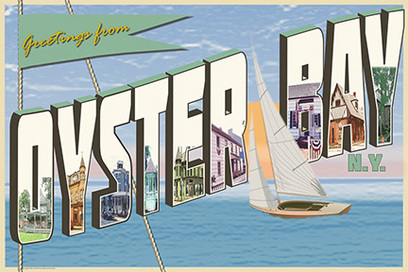 For more information on all of the festival's concerts and programs visit the Oyster Bay Music Festival web site. Author Phil Carlucci has collected more than two hundred images of public courses, private clubs, long-gone layouts, tournament play, and local golf figures dating back to the 1890s at Shinnecock Hills through the present day, with looks along the way at courses like the original Lido Club and Montauk Downs, the paved-over Milburn and Meadow Brook clubs, and relative newcomers like Great Rock and Willow Creek. Images were collected from local clubs, golf associations, libraries, historical societies, municipalities and personal archives. The program is free and open to the public. 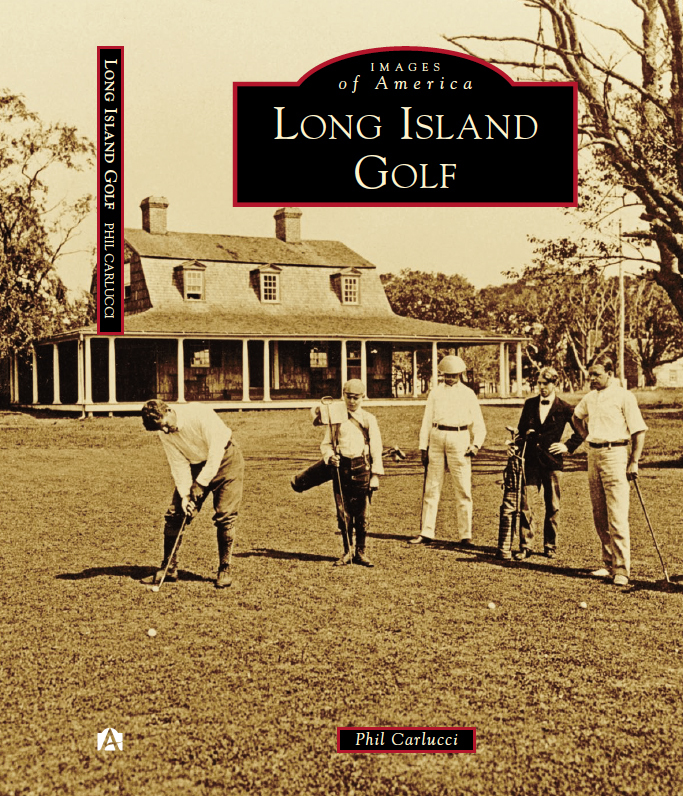 Copies of Long Island Golf will be available for signing and purchase. Light refreshments will be served. Contact the Historical Society at 516-922-5032 for more information. The Oyster Bay Historical Society celebrates its annual members' meeting with a garden party reception on Sunday, June 21, at 1:00 pm. 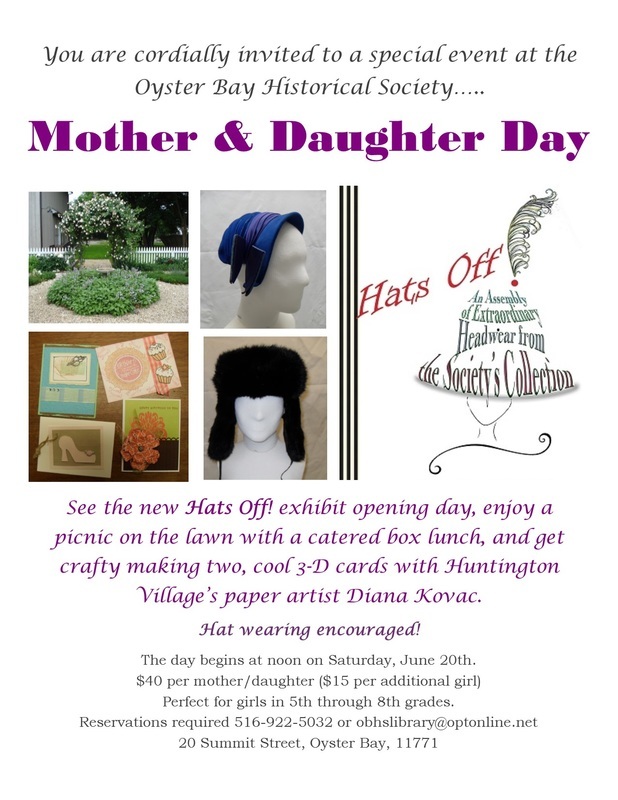 The program features refreshments in the Society’s Colonial Garden, a review of the Koenig Center’s latest acquisitions by Librarian and Archivist Nicole Menchise, and a chance to see the new summer exhibition, Hats Off: An Assembly of Extraordinary Headwear from the Society’s Collections. Oyster Bay is rich in Colonial history, and the Historical Society has a sure-fire craft to ignite your child’s imagination. 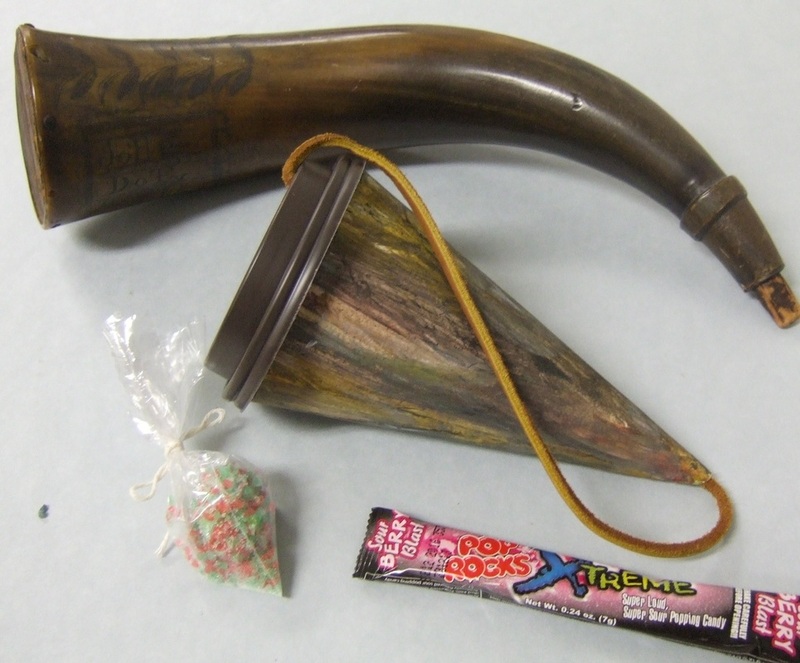 Kids will create and build their own powder horn and tricorn hat with inspiration from real 18th-century powder horns from the Society’s collection. Space is limited. 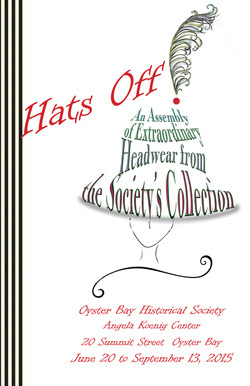 Contact the Society for details and reservations at 922-5032 or obhslibrary@optonline.net. motivation for creativity in an ancient and traditional medium. 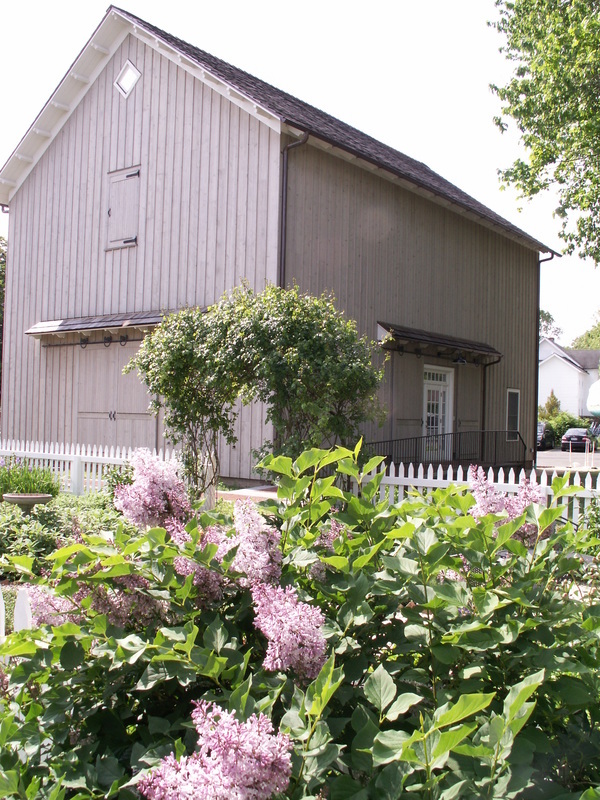 A portion of the proceeds from the sale of exhibited art supports the programs and exhibitions of the Society's Angela Koenig Research and Collection Center. Alexander Katlan has established a fully equipped conservation laboratory that for forty years has provided museum-quality work, documentation of fine paintings, and research for clients in the New York metropolitan region, New England, and beyond. In his May 20th presentation at the Oyster Bay Historical Society, Mr. Katlan will share his four decades of experience in the business of art conservation, describing best practices for the care of paintings, while illustrating how the restoration of a painting can yield clues to identifying an anonymous artist (or forger). As a special feature of his presentation, Mr Katlan will examine artworks from the Society’s own collections. The lecture begins at 7:00 pm in the Oyster Bay Historical Society's Angela Koenig Research Center (behind the historic Earle-Wightman House), at 20 Summit Street in Oyster Bay. Admission is $15 for the evening’s program. Light refreshments will be served. 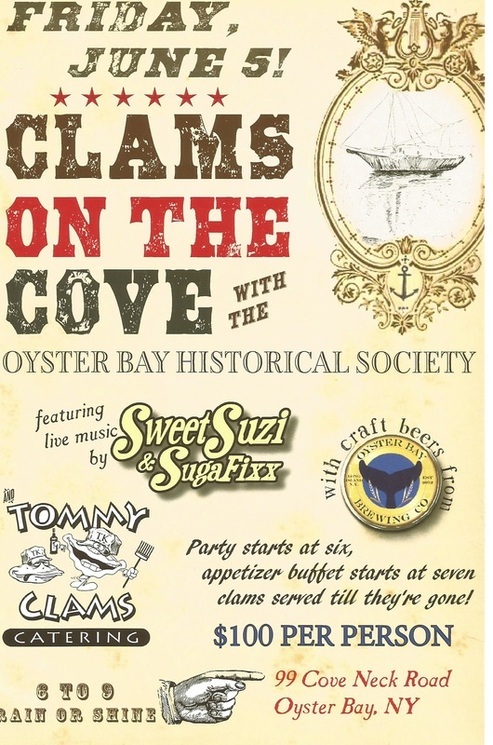 Contact the Oyster Bay Historical Society at 516-922-5032, or email obhsdirector@optonline.net for details or to make a reservation. Back again for our third year in a row! 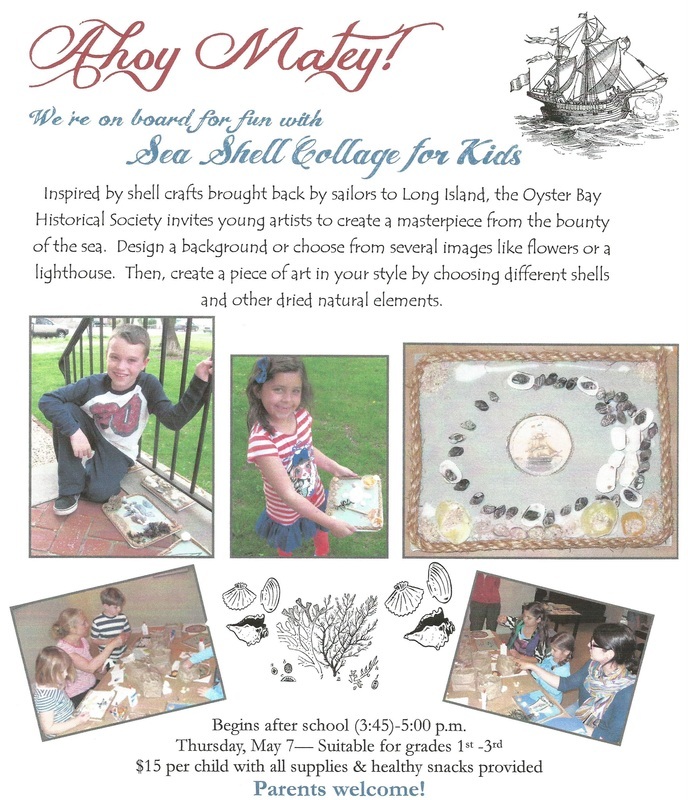 Inspired by sailors' valentines brought back to Long Island from the Caribbean in the 19th century, the Oyster Bay Historical Society invites all little mates to join in the fun creating their own collage from shells, sand, and other dried natural elements. Design your own background or choose from an assortment of sea life, ship, or lighthouse pictures. 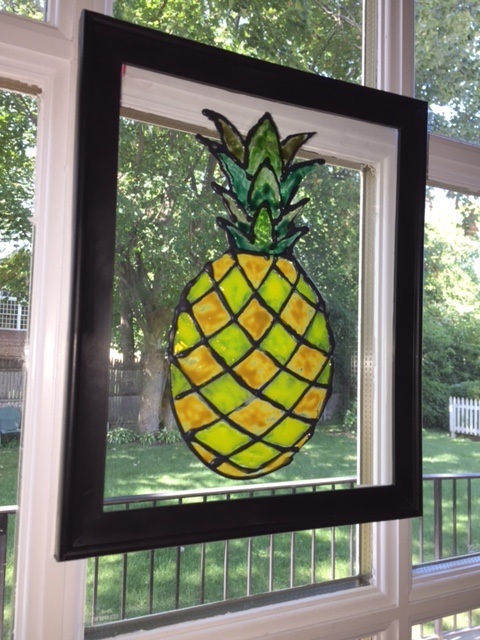 Take home a unique, framed piece of art ready to be displayed as a family keepsake or a gift for Mom! Parents welcome to participate. 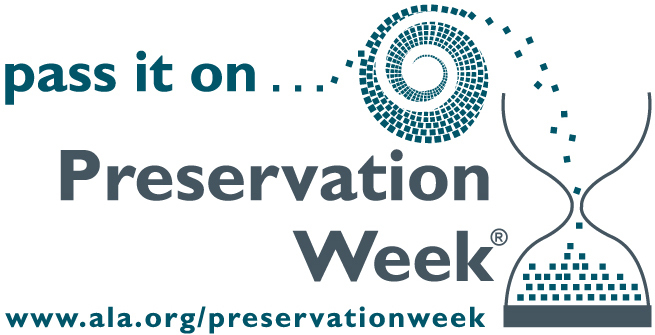 April 26th – May 2nd is the American Library Association’s designated Preservation Week and the Oyster Bay Historical Society is participating by holding an informal workshop. Nicole Menchise will present and supply information regarding the preservation of items we hold most dear – our unique family treasures. 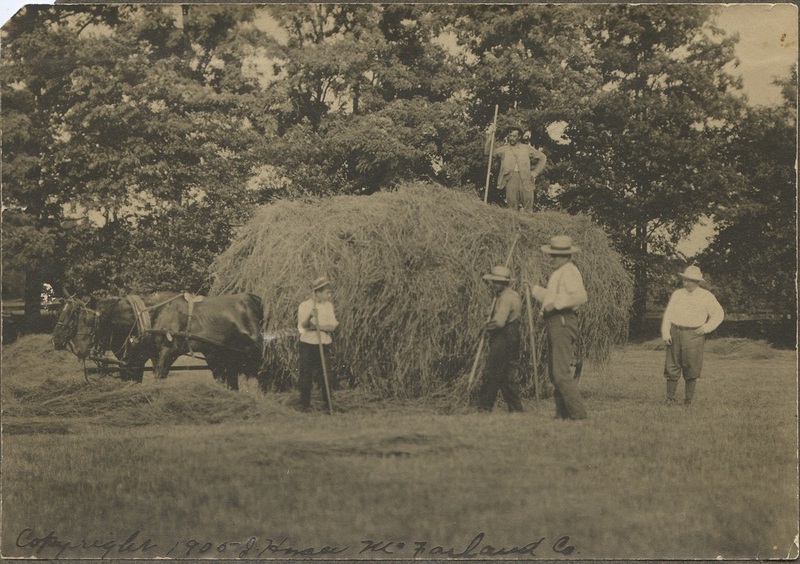 Topics to be discussed include best practices for the display and long-term storage of papers, books, textiles, and photographs, and will include examples taken from the Society’s collection. 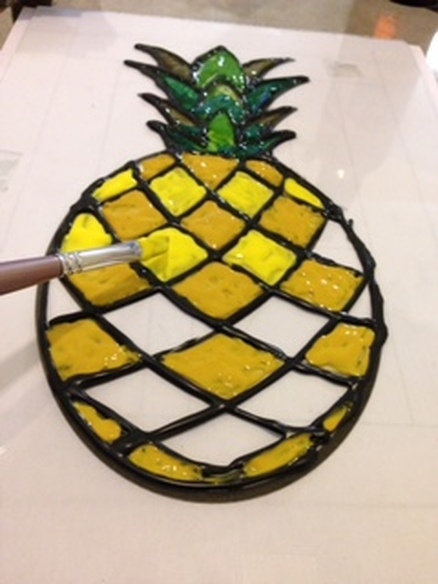 Past programs include creating an oral history recording, glass and ceramic care and scrapbook preservation. The workshop will be held Wednesday, April 29th 2015 from 6:00 to 7:30 p.m. at the Oyster Bay Historical Society in the Koenig Research Center (behind the Earle-Wightman House), 20 Summit Street, Oyster Bay, NY. 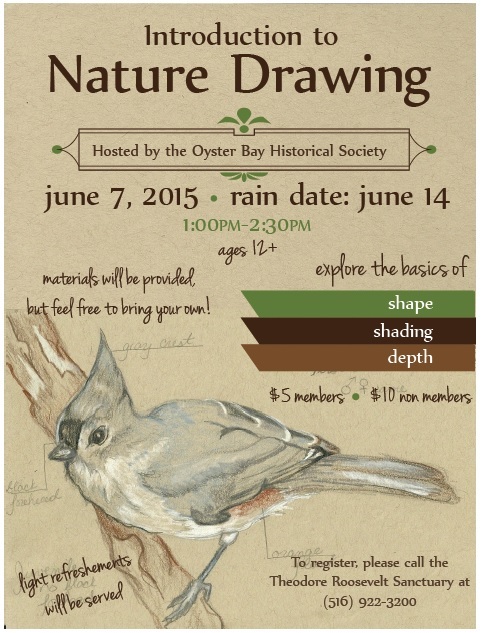 Free to members of the Oyster Bay Historical Society, $10 for non-members. Light refreshments will be served. Attendees may bring items they feel need to be specifically inspected, however no appraisals will be given as this is strictly regarding conservation practices. Although no battles were fought on Long Island, the Civil War affected every one of the 101,000 people living in current-day Queens, Nassau and Suffolk counties. More than 3,000 young men -- white and black -- answered their country’s call to preserve the Union by serving in the army or navy. There were training camps for regiments on their way to the front, Confederate ships marauding within eight miles of Montauk Point, anti-war protests and a little-remembered draft riot in Jamaica in 1863. 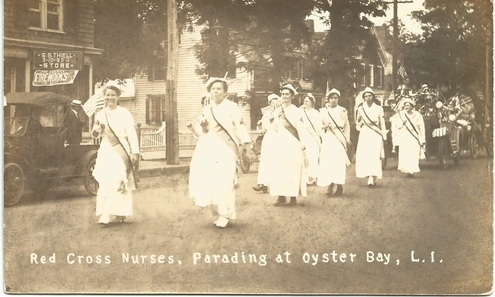 Local women raised thousands of dollars for Union hospitals, and Long Island companies manufactured uniforms, drums and medicines for the army. 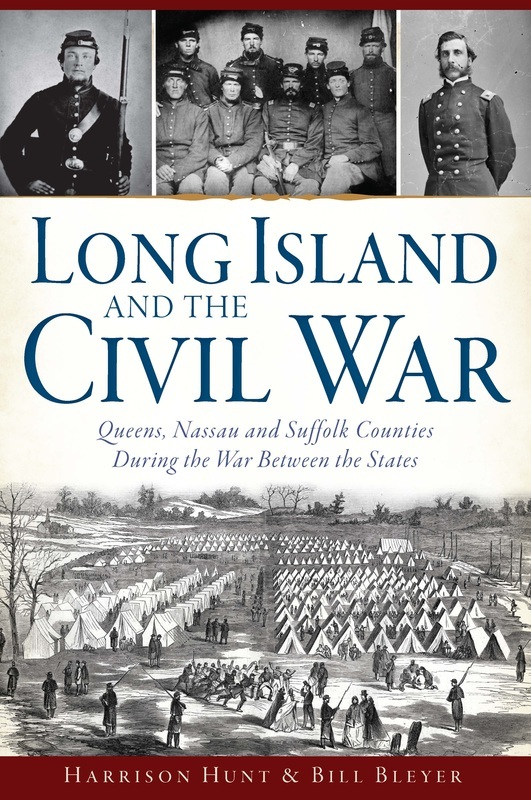 Long Island and the Civil War explores this fascinating story, from the 1860 presidential campaign that polarized the region to the wartime experiences of Long Islanders in the field and at home, and through the last local veteran’s death in 1945 to the history buffs who keep the memory of the conflict alive. 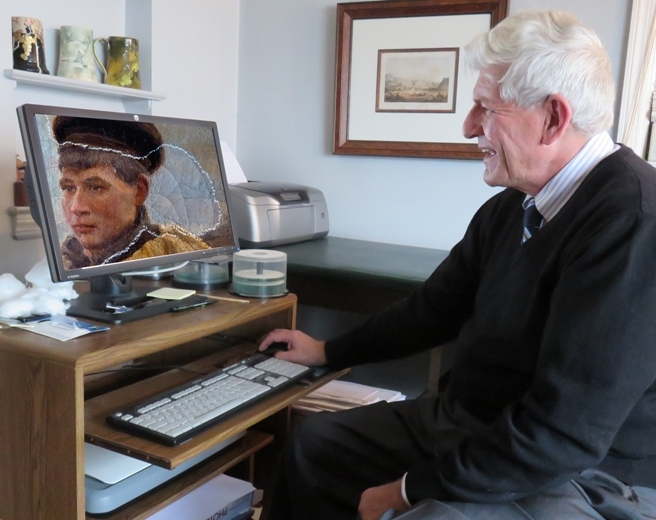 Harrison Hunt, who has researched Long Island’s role in the Civil War for more than 20 years, has written two other books about the conflict: Hallowed Ground, an overview of 17 key battles, and Heroes of the Civil War, brief biographies of 70 wartime figures. 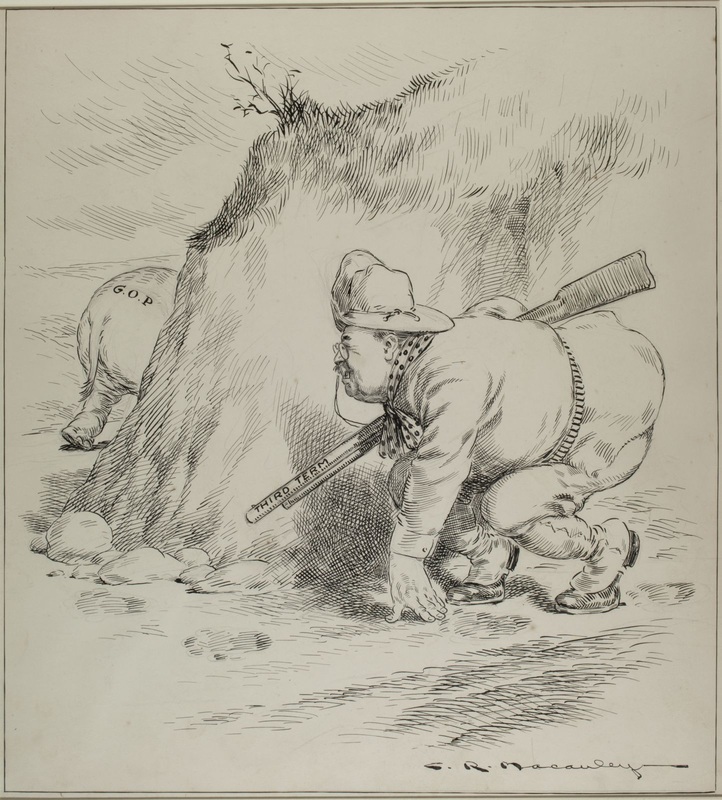 Hunt has explored the topic at numerous historical societies, libraries and Civil War Roundtables, written several articles on the subject, and curated two major exhibits about Long Islanders and the war. He has led tours of the Gettysburg battlefield; given presentations about military history at the New-York Historical Society and Gettysburg National Military Park; and served as a consultant to the noted Civil War artist Mort Künstler, whose portrait of Hunt is seen above. Before his retirement, Hunt was the Senior Curator of History and Supervisor of Historic Sites for the Nassau County Department of Parks. He holds a B.A. in History from Hofstra University and an M.A. in History Museum Studies from the Cooperstown Graduate Program, where he was a National Museum Act Fellow. He lives in a Civil War-vintage house in Catskill, New York, with his wife Linda. Story,” a year-long daily history of Long Island that resulted in three books and filled hundreds of pages in the newspaper.Bleyer contributed a chapter to the anthology “Harbor Voices – New York Harbor tugs, ferries, people, places & more” published in 2008. And he was a contributor and editor of the Bayville history book published by Arcadia in 2009. 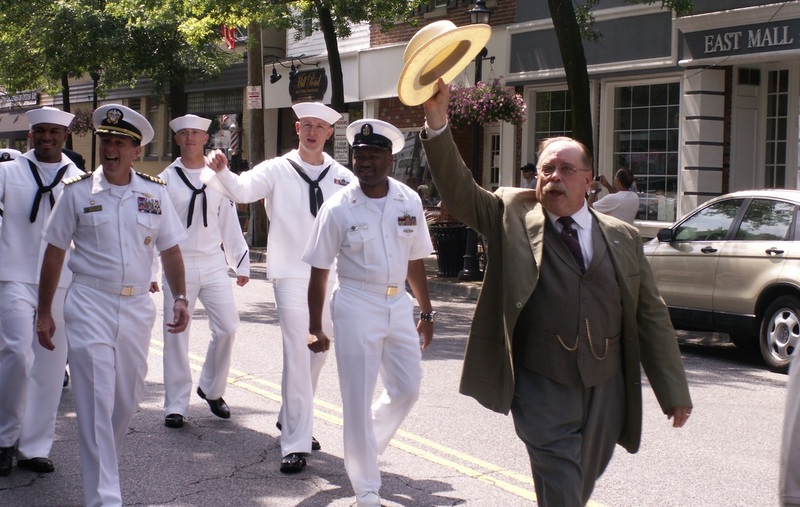 His work has been published in Civil War News, Naval History, Sea History, Lighthouse Digest and numerous other magazines and in The New York Times, Chicago Sun-Times, The Toronto Star and other newspapers. 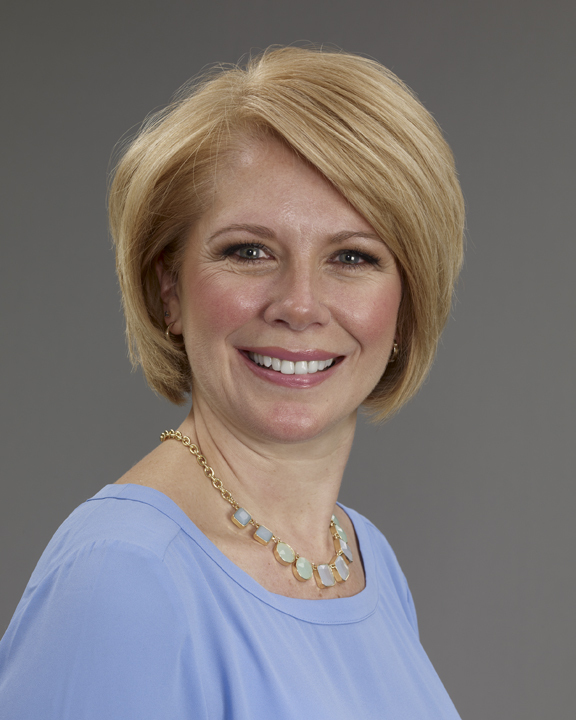 Prior to joining Newsday, Bleyer worked for six years at The Courier-News in Bridgewater, N.J., as an editor and reporter. He began his career as editor of the Oyster Bay Guardian for a year. Bleyer graduated Phi Beta Kappa with highest honors in economics from Hofstra University, where he has been an adjunct teaching journalism and economics. He earned a masters in urban studies at Queens College of the City University of New York. 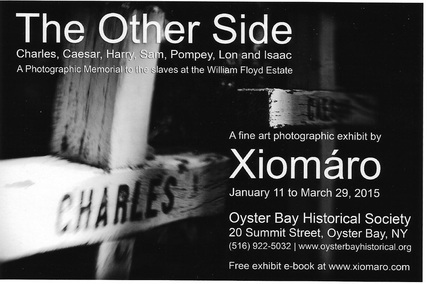 The Oyster Bay Historical Society’s 2015 season opens with the exhibition The Other Side – Charles, Caesar, Harry, Sam, Pompey, Lon and Isaac, a photographic collection by New York artist Xiomáro (SEE-oh-MAH-ro). The collection of twenty-nine photographs will be on view from January 11 to March 29, 2015. The Other Side looks at the William Floyd Estate, a National Park unit of Fire Island National Seashore. 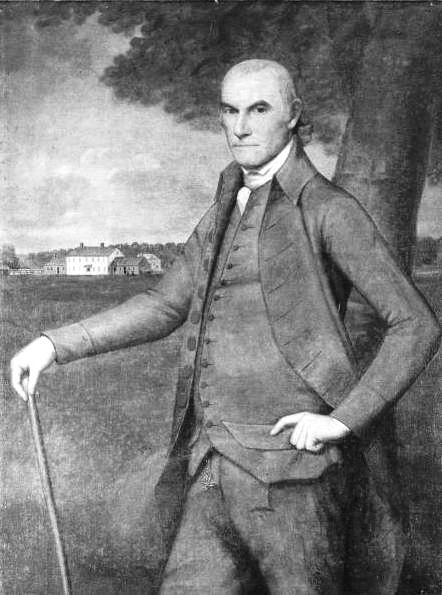 Long Island plantation and slave owner William Floyd (1734-1821) represented New York in the First Continental Congress in Philadelphia, where he set his signature to the Declaration of Independence in July 1776. Photographs on exhibit provide landscape vistas of the estate grounds as well as intimate interior views of rooms not included in regular tours of the house. Xiomáro is a nationally exhibited artist from Roslyn Heights whose work has been covered by The New York Times, News 12 Long Island, and The Huffington Post. The Other Side will be featured in the prestigious Aspect Ratio, a London-based photography magazine. His other National Park Service commissions include President Theodore Roosevelt’s Sagamore Hill mansion, which debuted at the Oyster Bay Historical Society in 2013 before traveling to Harvard University. At present, Xiomáro is photographing the home of poet and abolitionist Henry Wadsworth Longfellow (a friend of Roslyn’s William Cullen Bryant) and will be living in a Florida swamp for a month documenting the fragile ecosystem that feeds into the Everglades. In 1677, under the threat of losing all of the land purchased by the Native Americans, the people of Oyster Bay had little choice but to pledge allegiance to King Charles II and to sign the Andros Patent. This document essentially allowed the townspeople the right to ownership of their land under English rule as is was when it was purchased as a Dutch colony. There was one extra stipulation: that every year on March 25th, the people of Oyster Bay were to send a fatted lamb to the King as a symbol of loyalty and as a reminder of their subjugation. For this one evening, the Oyster Bay Historical Society will turn the Koenig Research Center into an old Colonial tavern. With hearty pub fare, lively traditional music by Larry Moser and friends, plenty of libations served by lovely lasses, and a round or two of history trivia with the winners taking turns caning old King Charles. It's going to be a night you won't soon forget. 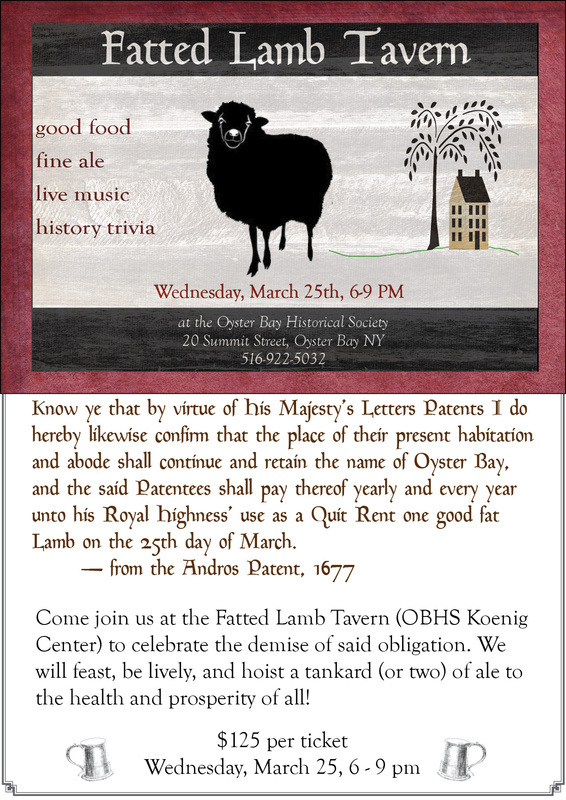 Join us Wednesday, March 25th from 6-9 p.m. and have a rollicking good time at the Fatted Lamb Tavern! 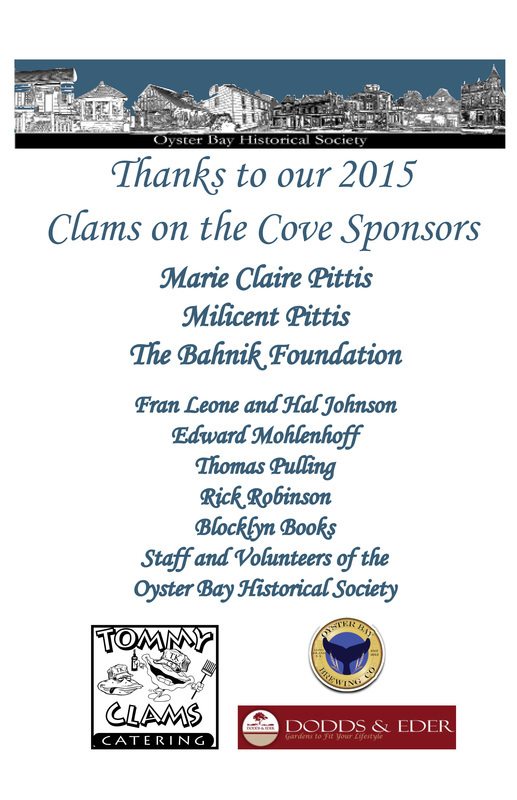 The Oyster Bay Historical Society is a 501(c)(3) tax-exempt organization. A portion of the $125.00 donation which exceeds the fair market value is tax-deductible. 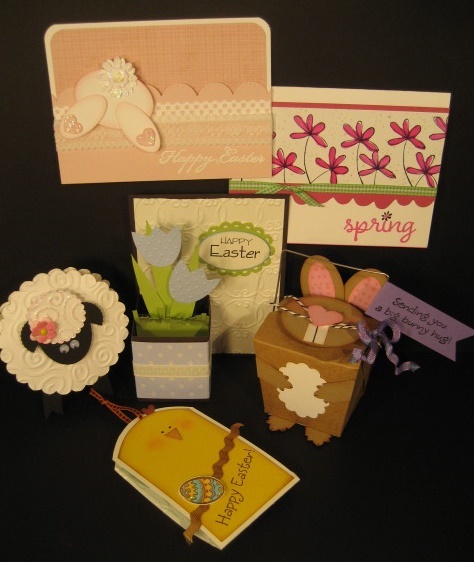 Celebrate spring by making fun and fancy cards and treat-holder boxes (great for chocolate). 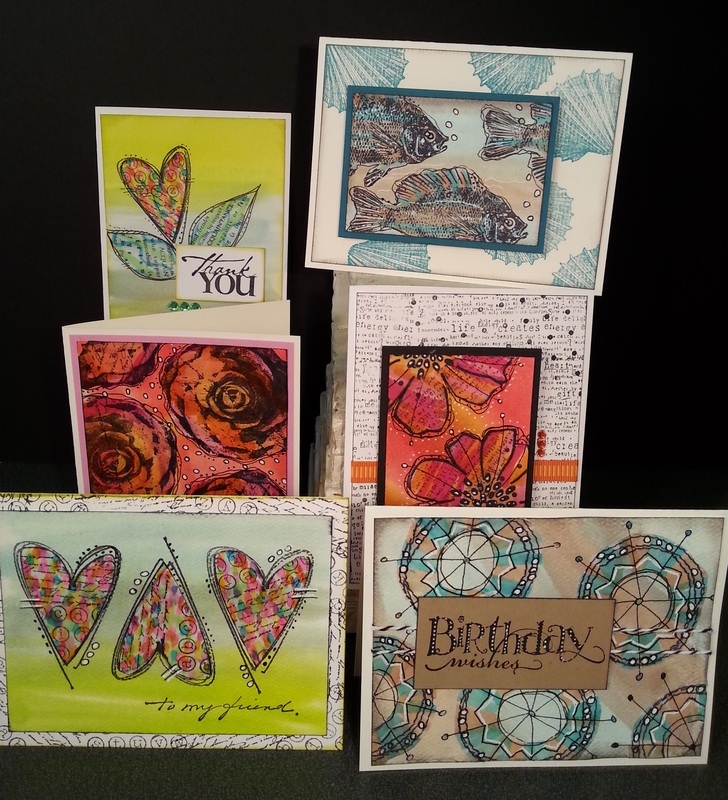 Create tulip cards that fold flat for mailing-- an easy and versatile design that can be adapted to many variations. Bunny cards work both as gift-card and baby-gift holders. Bunny boxes hold small gifts or a lot of candy. Spring lambs are designed to hold a Reese's egg, but can really hold any treat you choose. And the chick tags hold M&Ms. The class fee is $30 and includes all materials you need to make your cards and boxes. You can pay at the door, but please register by calling the Society at 516-922-5032, or class instructor Diana Kovacs at 631-578-4656. 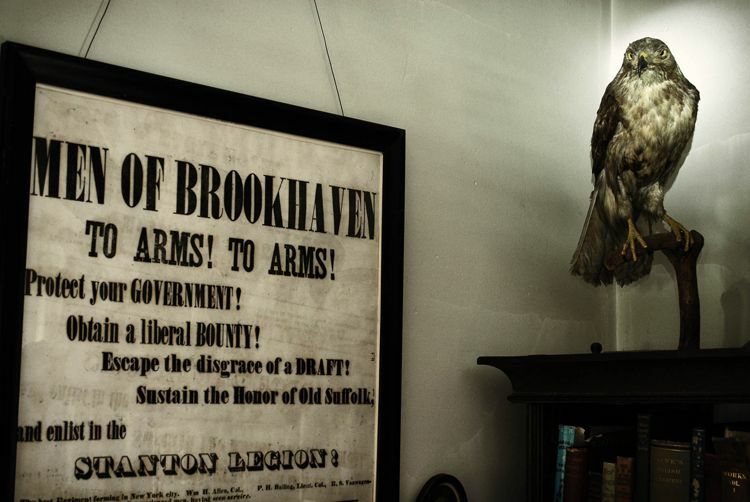 Time has dealt kindly with James Harvey Doxsee, Islip's best-known citizen. His physical condition is unimpaired, while his mental faculties continue to grow bright with age, and he daily discharges the many duties that devolve upon him with the vim of a schoolboy in the first flush of vigorous manhood. 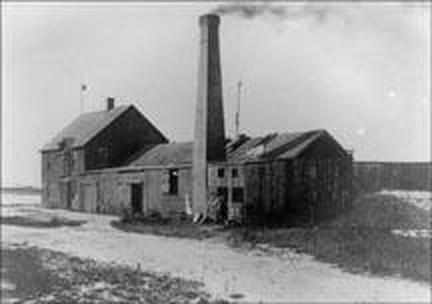 James Harvey Doxsee, with his brother-in-law Selah Whitman, founded the Doxsee Clam and Seafood Canning Company in Islip at the close of the American Civil War, becoming the first Long Island enterprise to can hard shell clams. Following the collapse of the Great South Bay's shellfish industry at the end of the nineteenth century, James Doxsee's eldest son, Henry, relocated to Ocracoke, North Carolina, to set up a new business. Another son, John, began to set fish traps after the canning business closed for good in 1905. Operating at first out of Islip, John Doxsee moved his business to Meadow Island in Freeport. Since 1933, the family has made Point Lookout its center of business operations. On Sunday, February 22, MaryLaura Lamont, Park Ranger at Fire Island National Seashore, visits the Oyster Bay Historical Society to present a slide program on the 250-year history of the William Floyd Estate. This Long Island plantation was home to William Floyd, one of New York State’s four signers of the Declaration of Independence. 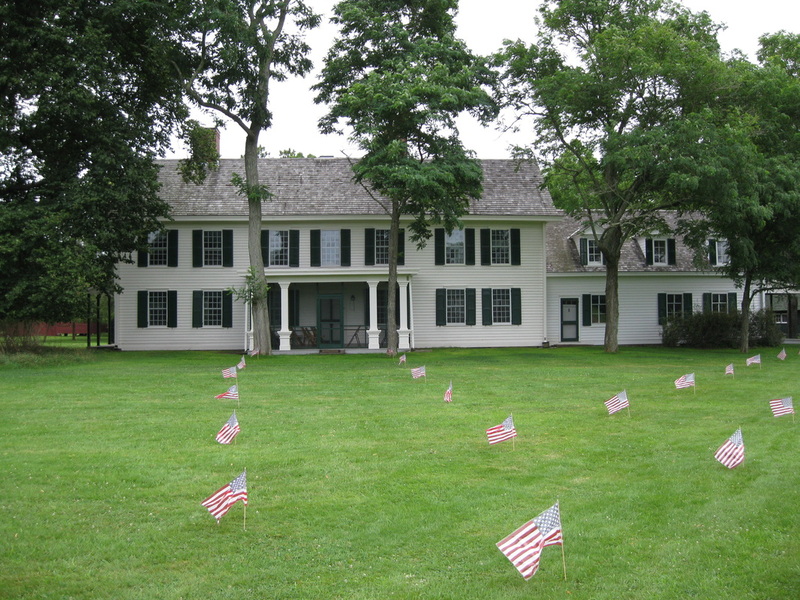 The 613-acre estate remained a Floyd-Nichols homestead until 1977, when the family donated the fully furnished Old Mastic House to the National Park Service, before conveying the remainder of the property in 1991. Naturalist and Park Ranger MaryLaura Lamont oversees interpretive programs at the William Floyd Estate, as well as serving as the education chair of the Long Island Botanical Society. She is a former compiler of the Orient Christmas Bird Count and worked during the 1970s at Oyster Bay’s Theodore Roosevelt Sanctuary and Audubon Center. Tissue Paper Collage Technique Class This Week! So, here's an opportunity to get your crafting on. This week's class teaches a great technique! So much fun, and very "mixed media". We'll incorporate watercolor paper, dye inks, alcohol markers, tissue paper, gel medium and gel pens. We'll doodle & stamp our way to some really funky designs. The cost of the class is $30, which includes all the materials you'll need to complete the projects. To register, call 516-922-5032. Please join us as Frank Carl and Denice Sheppard discuss the contributions that men from the Town of Oyster Bay made during the Civil War. The military documents and pension files of Oyster Bay resident David Carll, who served with the 26th United States Colored Infantry, tell a compelling story of what these brave men endured during the War of the Rebellion. This Black History Month event begins at 1 pm in the Society's Angela Koenig Center at 20 Summit Street in Oyster Bay. Attendance is free and open to all. Recently rediscovered and digitally converted, five silent-film World War I documentaries from the Society’s collections will screen during a special movie night on the eve of the war’s centenary. Originally distributed in 1919, these short documentaries (total run- time approximately 100 minutes) were part of a larger series created by the War Department during the Great War. These reels were offered to the public through Empire Prints and Eastman Kodak. This rarely seen footage includes scenes from battles in the "No Man's Land" of Meuse-Argonne and Chateau-Thierry; a trip on the U.S.S. Leviathan; the sinking of battleships by U-Boats as well as the capture of German prisoners and Armistice Day celebrations. The screening begins at 7 P.M. at the Koenig Research Center (behind the historic Earle-Wightman house), 20 Summit Street, Oyster Bay, New York, on Wednesday, February 4th.Popcorn and soft drinks will be served. $10 per ticket for members and $15 for non-members. For more information call 516-922-5032. In 2008 the National Park Service approved a project to rehabilitate the Theodore Roosevelt Home at Sagamore Hill National Historic Site. 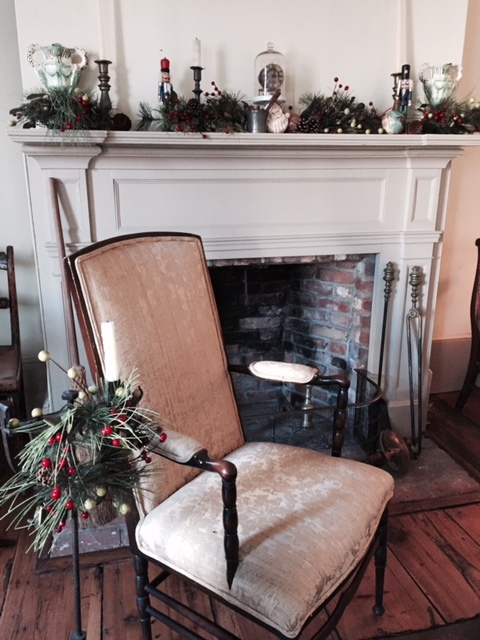 Susan Sarna, Museum Curator at Sagamore Hill, will lead a PowerPoint presentation on the planning, packing, and implementation phases of the project, including the plan to re-install the furnishings. The project goal was a comprehensive interior and exterior rehabilitation. The park hired John G. Waite Associates, an architectural firm that specializes in historic preservation and restoration, to conduct a baseline study of the house's current condition and create a restoration plan. This research and planning was completed in 2012. Plans called for restoring woodwork and flooring, and upgrading the electrical and mechanical systems, fire suppression, and security on the interior. Exterior work included installation of a new roof, gutter and drainage system, waterproofing of the foundation, and rehabilitation of historic windows, doors, siding, and porches. Construction began in September 2012 and is scheduled to be completed in July 2015. Due to the extent of interior work expected to be done, park staff began planning for and moving the house's 18,000 historic artifacts in 2011. The work involved in protecting the park’s museum collection and the house's historic features became its own project.